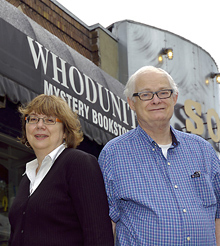 In honour of the Whodunit Bookstore’s 21st anniversary celebrations, I asked owners Jack and Wendy Bumsted to sit down to an e-interview. And read the interview below. Jack and Wendy’s individual answers to my questions are indicated by their respective initials. CM: What do you enjoy most about being being mystery booksellers? And what do you enjoy least? WB: Talking about a genre which interests us, and is of interest to the customers is wonderful. As the vast majority of our customers are only visiting because they like the genre, the exchange of knowledge is very easy and pleasant between us and them. Not only do we introduce people new authors, we also occasionally get introduced to new authors ourselves; customers who visit other countries often give us the scoop on who is being sold at stores they visit abroad. What I enjoy least is the paperwork. There is a relatively large amount of paperwork involved in bookselling which we largely overlooked as outsiders. That paper is still the major form of communication between us and the publishers, has meant we are unable to streamline the process as much as we would like. JB: The customers are the best part of running the shop. We have a wide range of customers from different backgrounds and interests, all of whom are interesting to chat with. As we have gotten to know them more and more, we have come to appreciate them as people as well as customers. Getting books into the store is the least pleasant part of the job. The trouble we have with publishers, distributors, and couriers is constant. Publication date changes, importation battles, and delivery problems make fulfilling the expectations of our customers more difficult everyday. CM: Here I show my own interests. Are mystery books set in Canada an easy or a hard sell? WB: Both. Some customers (local and visiting) want to read Canadian, or books set in Canada by Canadian authors. We have customers who want Winnipeg, or Canadian books. But the fact that a book is set in Canada is not a major selling feature for the majority. For us, we just want to sell good mysteries, so we have abolished Local and Canadian subsections. They are integrated into the general population. JB: I agree. Most of our customers are not especially interested in local/Canadian authors. The authors that transcend that designation however, are able to take advantage of being from Winnipeg to increase their popularity among our clientele. CM: What trends in mystery writing do you find most striking, say, in the last decade? WB: The growth of Scandanavian writers, obviously. While some writers like Jo Nesbo were published prior to the “Girl with…” books, Stieg Larsson gave an impetus to the increased translation of more and more writers. It has also led to a large number of previously translated authors, for example, the Swedish writing team, Maj Sjowall and Per Wahloo, being reissued after many years in the shadows. JB: Increase in translated works in general has been rising, in fact. We now have 4 to 5 new titles each month that have come from non-English parts of the world. Not only are most of them exceptional works of fiction, they often also provide new perspectives on crime fiction, and the world. They are full of new information. CM: What trend in recent mystery writing or publishing do you find most annoying? WB: Two things: first, translations being published out of the original order. Anne Holt in particular, but Jo Nesbo and many other writers have been given the same treatment. A more recent example might be Michele Giuttari, who had 5 books translated and released within weeks of one another, and 5 and 6 arrived before 3 and 4! Secondly, series in general are a growing problem. One of the hardest things is when a customer discovers a new author, and wants to read the series from the beginning. If this is a long running series, or one that really needs to be read in order (of which there are also a growing number) this is a particular problem. Finding the earlier books, in any format, new or used, can be a real challenge. JB: The franchise is an extension of the series problem. Publisher’s and estates will sometimes not let an author die. Listed either as collaborations, or with the original author’s name on the cover in the possessive, these books often do not measure up to the original, and in my opinion, should not be encouraged. It is especially problematic when the new author has an independent track record which is being disrupted in order to continue the franchise.